H. Wilfrid Walker : Surfboards in Fiji, c1900. 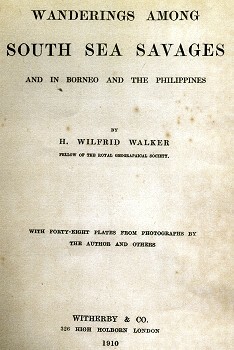 Wanderings Amoung South Sea Savages and in Borneo and the Philippines. Witherby and Company, 326 High Horborn, London, 1910. First Impression 1909, Second Impression 1910. A very brief, but highly complimentary, account of Fijian women riding surfboards on the island of Vuna. Unfortunately Walker's recollections are undated, however as they are based on letters he had sent home to relatives in England and his wanderings covered a period of twenty years, the dating of this entry at 1900 is conservative, and it is possibly earlier. After arriving in Vanuatu, the capital of Fiji, Walker sailed to Taviuni where he stayed with local identity Ratu Lala in the village of Somo-soma. The surf-riding exhibition was observed on the island of Vuna, about twenty miles from Taviuni. My Further Adventures with Ratu Lala. We came to fish, and fish we did, just off the coral reef, but it would take space to describe even one-half of the curious and beautiful fish we caught. When I took the lead in the number of fish caught, Ratu Lala seemed greatly annoyed, and I was not sorry to let him get ahead, when he was soon in a good temper again. The Fijians generally fished with nets and a many-pronged fish-spear, with which they are very expert, and I saw them do wonderful work with them. They also used long wicker-work traps. Ratu Lala, on the contrary, being half-civilized, used an English rod and reel or line like a white man. Ratu Lala told the women here to give an exhibition of surf-board swimming for my benefit. the rocks which fringed the coast. I had seen the natives in Hawaii perform seventeen years before, but it was tame in comparison to the wonderful performances of these Fijian women on this dangerous rock-girt coast. Geoff Cater (2010-2017) : H. Wilfrid Walker : Surfriding in Fiji, 1900.